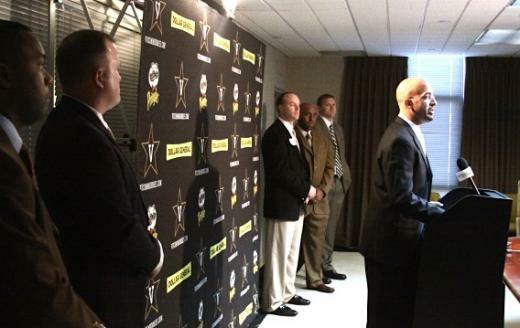 James Franklin introduced some of his initial coaching staff hires at a Vandy press conference on Jan. 13, 2011. Photo by Vanderbilt Athletics. James Franklin said he wanted to announce his new staff at Penn State all at once. But his own coaches beat him to the punch. And they are Franklin’s own coaches. Very much so. Franklin promised “fierce loyalty” to his Vanderbilt staff when he was introduced on Saturday, didn’t he? Now, that loyalty also must transcend to three-quarters of a million Penn State students, alumni, faculty and staff -- not to mention tens of thousands of Nittany Nation fans. All eight of Penn State’s newest employees worked with Franklin at Vanderbilt, while four also worked with him at Maryland or Kansas State. Seven of the eight hires made by Franklin so far have posted on their Twitter accounts that they are now Penn State football coaches. That’s one way to be transparent. If Franklin was trying to manage the message, the Tweet leaks did anything but. Hiring procedures and clearances must be followed when making hires at Penn State, especially these days. But if so, why are nearly all of Franklin’s assistants taking their Tweets public? The new assistants are dressing up their accounts myriad ways, all touting their Penn State ties one way or another, via Twitter handle, Penn State logo (some odd thing with stripes – don’t tell licensing), bio, background photo and/or Tweets of Beaver Stadium and even a Happy Valley sunrise. Only strength and conditioning coach Dwight Galt has not announced that he’s now an employee via Twitter. But some of Penn State’s players, in interviews earlier this week, shared that Galt is on board. Otherwise, Franklin’s group is set. None have played at Penn State. None have coached at Penn State. Perhaps Franklin is still considering a blue- and white-oriented hire. The 2013 Penn State media guide lists 60 former Nittany Lions currently in coaching. And there are over 1,000 living Penn State football lettermen. Penn State’s had some pretty good teams, too, with 942 overall victories. Gattis, PSU’s new wide receivers coach, has three years of full-time experience – two at Vandy and one at Western Michigan. Perhaps Bobby Engram, with his record-setting career at Penn State, 14 years in the NFL and three years coaching with the San Francisco 49ers and Pitt, was considered as well. So far, Franklin is continuing the trend set by athletic director Dave Joyner -- the man who hired him and a Penn State alum -- since Joyner himself was hired in November 2011. As I wrote last week, since Joyner became athletic director, only 2 of the athletic department's 37 hires of coaches or directors of operations have been Penn Staters. On the Penn State football staff, the last two holdouts from the Paterno Era who were on the 2013 staff (although Ron Vanderlinden was fired/resigned at season's end) aren’t options. Larry Johnson is now @Rushmen1 at Ohio State and since Pry – an Altoona native -- holds a Twitter that says @CoachPry_LBU, it is very unlikely Vanderlinden will get a call. We know all eight of the Vander State guys have worked with Franklin at his stop before Penn State -- Franklin has been at 11 places in 20 years, if you count his Maryland stints as two. Donovan and Galt also worked with Franklin in his two-part, eight-year stint at Maryland. The latest hire, Huff, also worked with Franklin at Maryland for a year. And in addition to Vandy, Rahne coached with Franklin during his two years at Kansas State, as a GA the first year and coaching running backs the second. A few more tidbits, which compare Franklin’s nearly-completed group with O’Brien’s 2012 powerhouse staff, the first group of Penn State football coaches not led by Joe Paterno since 1965. Bear in mind that Franklin has two more hires to make. -- Franklin and his seven on-the-field coaches have a combined 110 seasons of full-time coaching. (Years as graduate assistants or as recruiting assistants only are not counted.) Of those 110 seasons, 64 (58%) have been at the NFL or major-college FBS level. Counting O’Brien and his assistants – two more than Franklin has at this point -- his 2012 staff had 175 out of 231 seasons at the NFL or major-college level, or 76%. So, at the big-time level, Franklin and his current Vandy crew average 14 years of full-time coaching, nine of them at the major college/NFL level. O’Brien’s first group -- which he put together while he was also prepping Tom Brady for the Super Bowl -- averaged 23 and 17.5. -- The most recent stop for every member of Franklin’s staff was Vandy, except for Huff, who spent two years at Vanderbilt before coaching at Western Michigan in 2013. As for O’Brien? His 2012 staff had last coached with the New England Patriots, Auburn, Ball State, the Buffalo Bills, Miami (Ohio), Penn State, Penn State, South Carolina, the Tennessee Titans and the University of Texas. A guy I know was at Duke at the same time that O'Brien was there as an assistant coach, and he said O’Brien always worked to be the smartest guy in the room. With that 2012 staff, it wasn’t that easy for him – despite being a graduate of Brown. Mike Poorman has covered Penn State football since 1979, and for StateCollege.com since the 2009 season. His column appears on Mondays and Fridays. Follow him on Twitter at http://twitter.com/PSUPoorman. His views and opinions do not necessarily reflect those of Penn State University. 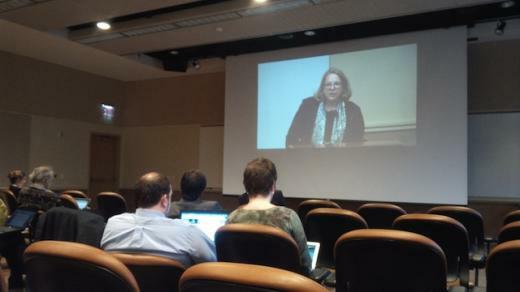 During a special meeting Thursday with the Penn State Board of Trustees, a newly appointed governance consultant reminded members of their duties and suggested goals as she begins her work with the board. In November, the governance and long-range planning committee recommended and the full board hired Holly Gregory of Sidley Austin LLP, a law firm based in New York City.